Last week I dropped in to let y'all know that I'm still here, I've just been busy. And one of the things I've been busy with is BRASS STARS. 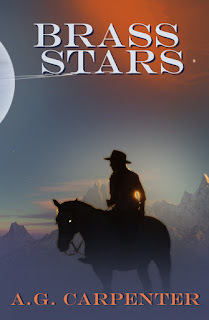 Some of y'all might remember that this SF Western novella was first published by Eggplant Literary Productions back in 2013. That was a year that felt like a really big deal as far as my writing career was concerned. This novella was accepted and published, and - after ten months and a shiteload of queries - I also found representation for The Steampunk Novel. It felt like the wheel was starting to turn in my favor after five years of working really hard to not only polish my craft, but push beyond short stories. I shared links and the gorgeous cover art and told myself that This is it. This is the break I've been looking for. And then things... just didn't go the way I thought. BRASS STARS sold, but not well. And then the publisher folded less than a year later and I was left with a book I loved, but was now a reprint. The good news is, I still love this novella to death. It's not a fancy book. It's not a literary book. It is a book about a snarky, sweary, determined woman who wants revenge. And a psychopathic, cybernetic horse. I mean, really? What's not to love? So, I am republishing this one myself, complete with additional revisions (about 10% new material) and a brand, spankin' new cover. The exact release date has not been decided on yet, but I should have a preorder page up on Gumroad in the next week or so. In the meantime, you can check out the cover and blurb below. last man in the posse that killed her mother. The plan is simple. Get in, kill Brannigan, and get out, and nothing is going to stand in her way. Not John Crow, an Extra Sapien like herself, trying desperately to win her heart. Not Diamondback Jack, a retired gunner who is determined to save her soul. Not even her own fear of the brutal darkness growing inside her. Fifteen years ago, Brannigan shot her and left her for dead. It’s time to return the favor. Every now and then you get a year that's just full of stuff - both good and bad. This spring I've managed to deal with the flu, a lingering (think 2+ months) cough, a head cold, and a fractured rib. I had a point, shortly after finally getting over the flu which knocked me out for two solid weeks, where I was frustrated because I felt like I hadn't gotten anything done. And then I sat down and looked at what I had written and realized that I already had almost 80k under my belt between Christmas and the middle of April. But, as we head into Memorial Day weekend - and near the middle of the year - I am trying to take stock of what I've accomplished and what's still to come. Suffice to say, if you are looking for more of my work, it's coming very soon. But, due to the repeated health issues and the sheer volume of work I've been tackling, I've not had much of a chance to talk about any of it here. Or much of anything else. That's about to change though as I am working on getting all the pertinent covers and links, etc together. So, please stay tuned. There's a lot of great stuff coming.